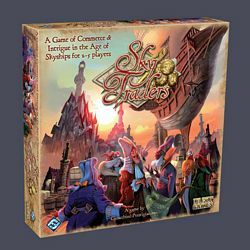 Launch your skyship into the clouds and experience adventure and intrigue in Sky Traders, a board game for two to five players. Evade ruthless Wind Pirates and manipulate the commodities market. Work with your peers to create larger profits for everyone, or try to undermine your rivals and keep all the money for yourself. Trade your way to fortune and fame as you attempt to take control of the powerful Sky Guild!